What is it: The second action adventure outing for the rebooted Lara Croft. The opening minutes of Rise of the Tomb Raider had me worried. It starts with Lara trudging slowly through the snow, my only requirement being to hold W as the game plays itself around me. All of sudden, I'm having flashbacks to 2013's Tomb Raider reboot and its interminable, set-piece heavy introduction. At one point during a cutscene laden climbing tutorial, I miss a prompt, fall and die. Redoing the section, I hit the prompt, climb a few feet higher, and watch another cutscene in which Lara falls but is fine. Here we go again? Actually, no. The opener is frustrating, but over quickly. From then on, Rise of the Tomb Raider sticks to a mostly consistent level of interactivity. There's still plenty of set-piece spectacle, but these pace-breaking action segments trust you to read the visual clues of the environment and react using the appropriate controls. There's a level of artifice to these sequences, but they operate within the framework of established interactions. This is emblematic of RotTR as a whole. It's not that Tomb Raider's missteps have been eradicated, but they've been dramatically reduced. There are fewer slow-mo QTE sequences, fewer awkward conversations, fewer by-the-numbers miniboss fights. They're all still there, but take up significantly less of 15-or-so hour running time. Lara's latest adventure opens in Siberia, and—aside from an early sojourn in Syria—that's where it stays. Lara is on the hunt for the Divine Source, an artifact that her father had obsessed over before his death. There's an important difference in the plots of RotTR and its predecessor. Here, Lara has initiated her quest. While things quickly spiral out of control, particularly after the appearance of militaristic cult Trinity, she's no longer an unwilling participant in events. That's crucial to how the game treats Lara. In Tomb Raider, she was frequently battered, bruised and impaled—and that's just if you were playing well. In RotTR, Lara can fall foul to a number of fatal traps, but in regular play she no longer feels like a victim of her environment. That's not to say the story isn't clumsy in places. There are times when the it all goes a little bit Avatar. 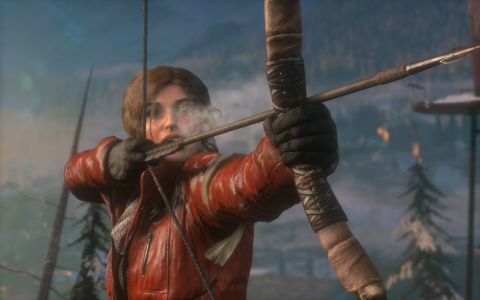 Lara stumbles across a tribe called the Remnant, and—despite their having lived in this Siberian wilderness for generations—she quickly proves to be the best at hunting, climbing and gunning down an entire army. Other elements of the story work much better. This is still Lara's origin, but, while she hasn't yet embraced her role as a globetrotting murderess, she is at least more accepting of it. There's a resolve that didn't exist before, and that means there's no clumsy disconnect between the story of a woman traumatised by her actions and the gleeful feeling of killing off a camp full of bad guys. It's just as well, because the combat remains highly enjoyable. Rise of the Tomb Raider—like its predecessor—deftly blends stealth and action. Most enemies begin unaware of Lara's presence, giving you the scope to creep through bushes and behind cover. With patience, and by chucking around objects to provide distractions, it's possible to systematically and silently clear out most enemy patrols. Often, it's more fun to take out a couple of guys and then choose to initiate a firefight. New for this outing is Lara's ability to craft combat tools on-the-fly. Arrows and special ammo can be created at any point, but you can also make use of things found around enemy camps. A bottle can be turned into a molotov cocktail; an empty can an IED. Doing so costs resources found out in the world, but I was never so low on them that I was unable to set light to a clustered group of soldiers. You craft combat tools by holding the middle-mouse button, thus keeping your keyboard hand free to control Lara's movements. As a result, scrabbling between cover while grabbing and arming a can is a frictionless process. It gives combat a welcome feeling of fluidity. The presentation does a lot of the heavy lifting. Scaling giant buildings or huge cliff faces still feels risky, even as the interactions involved are slim. When you're not fighting for your life—be it against soldiers or the crumbling ruins of an action set piece—you're exploring one of a handful of large, open hub areas. These are sprawling, intricate environments, and, for the most part, you can leisurely pick through them—the only distractions coming from the occasional wolf, bear or big cat that's taken a disliking to your continued existence. Platforming in Rise of the Tomb Raider follows a standard set of interactions, thrown together in a variety of combinations. Jump, swing, grab, attach—each action requiring a specific button press. It's a simple, streamlined system, and with the correct taps of space, E and F, you'll seldom run into any problems. It's a shame there's not more danger, but the presentation does a lot of the heavy lifting. Scaling giant buildings or huge cliff faces still feels risky, even as the interactions involved are slim. Graphics options: Lots, including a range of AA and anisotropic filter settings, as well as customisable texture quality, shadow quality, ambient occlusion, depth of field, tessellation, screen space reflections, dynamic foliage, bloom, motion blur, lens flair, and, most importantly, PureHair. Despite arriving months after the Xbox One version, the PC release of Rise of the Tomb Raider is a quality product—Square Enix's ongoing relationship with Nixxes again paying dividends. The graphics options are plentiful, with a variety of ways to tweak and customise the experience. While my 970 GTX couldn't keep up with the demands of running every option at maximum—dropping to a stutter during cutscenes and set pieces—a few sensible reductions had it running smoothly and consistently at 60 frames per second. Check out MaximumPC's optimization guide and detailed benchmarks to run the game smoothly on your PC. Each area is packed with things to find, and the rewards for hunting out collectibles often makes their presence worthwhile. Ancient documents fill out the story of the region, and level up your proficiency in one of the three languages you'll encounter. With a high enough language level, Lara can decode monoliths that mark down the location of coin caches on the map. Collect enough coins, and you can purchase special upgrades. Elsewhere, you'll find optional challenge tombs that boast some of the game's most intricate puzzle design. Each is short, but they repurpose some of the standard interactions in new and interesting ways. They're always worth seeking out, not least because they reward useful new skills. If there's a downside to the game's exploration, it's that—as in Tomb Raider before it—collectibles feel like the end goal rather than a bonus along the way. The route Lara must take through an area is rarely in question, especially when you're only ever a button press away from Survival Instinct—an optional view mode that highlights your next objective, any pertinent puzzle pieces, and any resources or collectibles for Lara to snaffle up. I miss the puzzle aspect of pre-reboot Tomb Raider games, where tombs felt like cavernous brain teasers. Lara visits plenty of ruins on this adventure, but all of them are solved through familiar and comfortable interactions. With only a few notable exception, surprise comes through spectacle rather than design. Outside of the campaign, you'll find Expeditions—a series of custom score attack modes that let you apply modifying cards to alter the challenge. Some card packs are earned for tasks completed in the campaign, and others can be purchased with points gained by playing Expeditions mode challenges. There's also the option to spend real money on card packs, which seems overkill given how frivolous the mode seems. Nevertheless, there are plenty of fun mutators that can be stacked to create unexpected combat encounters. It's also possible to play custom challenges created by other players, or create and upload your own. In many ways, Rise of the Tomb Raider is peak sequel design: an incredible similar game with a set of expanded and additional systems. But RotTR is also better because it lets you spend more time engaging with those systems. While it doesn't fully eradicate the missteps around the edges of interactivity, it does let you spend longer enjoying the core action and exploration. As a result, it's an incredibly competent action platformer.